Here is a guide to help try to avoid being cheated or scammed by a business or company and check out or evaluate a company for free before you decide to pay them money for services. Over the years a common theme has emerged where people feel they are scammed by a company or taken advantage of and it appears they have not checked them out before giving up their hard earned money for services. Here is my guide on what to do to help you from being a victim. Checking out a company or business before you pay them a lot of money is smart and prudent. It can help keep you from being ripped off. The largest issue I see when people are in trouble and looking for help is they tend to run to the first company that claims they can help them and they suspend commonsense or prudent measures and hope the company will perform the services they claim to be able to. It isn’t till later that people find out that the claims made may not have been true and then they are left in a worse spot and struggle trying to get their money back. There is no one surefire way to checkout a company so feel free to add additional suggestions in the comments below. Here is what I suggest doing. What is the Company Address?Ask the company to provide the physical street address where they are located if you were to visit them. Many companies hide behind a mail drop or postal center address.While it is true that some startup companies do legitimately use these mail centers to receive mail, it is also true that may fly-by-night outfits use them as well to shield themselves. They will close the mailbox and move on to the next thing.If a company is not substantial enough or can’t provide you with a physical street address then you may want to consider if they are going to be around if a problem occurs. If they do give you a physical street address with a suite number, do a Google search for that address and suite number. Many of those turn out to be virtual office spaces. They look like legitimate addresses but a little checking will show you they are just a fancier version of the mail drop mask. You can use the street address to take a look at it from the street using Google Maps. That can be extremely enlightening. Is the Company Registered?It’s easy to check to see if a company is licensed these days. A simple google search for ‘[state] corporation search’ will typically get you the link for the state you are searching so you can do a quick search of the the state records to see if they are registered.You will want to check the state in which they say they are located and your state. It is surprising the number of companies that are not licensed to conduct business in their own state. While a company may be operated as a sole-proprietorship and may not be a registered corporation or LLC with the state, that will at least give you a good idea how big they are and if they claim to be a “corporation, nonprofit, or LLC” they should be registered. Is the Company Licensed?If the company is selling you some sort of financial service or debt help, the chances are that their state and your state require some sort of licensing. This is true for both for-profit and nonprofit organizations.If a company is selling you debt help or a loan, they most likely should hold a state license or be exempt from licensing. Ask them for their licensing information to be able to provide a service. If they claim they are not required to be licensed, you can use the free debt relief compliance module to check if that is true. Recognize the Role of the Person is You Are Talking To.Typically the person you are talking to on the phone is either paid a commission or evaluated on one thing, making sales. The intentional or unintentional effort of a representative is to persuade you to use they services and enroll as a client with them. Don’t feel pushed. You need to understand the representative may say a lot of things that don’t wind up being supported in writing. They may engage in puffery or misrepresentation to get you to pay them money for services.If a company is attempting to sell you services and using the telephone, they must comply with the FTC Telemarketing Sales Rule. Ask the Company to Put Their Performance Claims in Writing.If a representative is willing to tell you they have a great success rate for the services they are selling, then they should not hesitate to share that data with you. In fact the Federal Trade Commission has some very clear guidance about how a company should do that.May I base my advertising claims on the experiences of some previous customers?Yes, but your sample must be representative of the entire relevant population of your past customers. To accomplish this you must, among other things, use appropriate sampling techniques, proper statistical analysis, and safeguards for reducing bias and random error. You can’t cherry-pick the most successful examples to inflate your results. If you advertise or represent that your customers will save a certain amount of money or reduce their debt by a certain percentage – for example, “We can settle your debts for 40% to 60%” – your statements must be truthful, and you must have objective proof to back them up. Your claims must accurately reflect the results you’ve achieved for previous customers. It’s important to consider the message your claims convey. Under the law, the FTC looks at claims from the point of view of reasonable consumers. Therefore, what matters isn’t the literal accuracy of the words you use, but rather your proof to support the “net impression” your message conveys. For example, claiming that your past customers have achieved “up to 60% savings” is likely to convey to new customers that they, too, will get savings of around 60%. If you don’t have solid proof to back that up, the claim is deceptive. State the savings based on the customer’s debt when he or she signs up for the program. You may not inflate savings figures or percentages by including interest and fees the credit card company adds after a customer signs up for your program. Example 8: Andy signs up with a debt relief service offered by Company H, owing $10,000 on his credit card. One year later, following negotiations with the credit card company, Company H negotiates a settlement allowing Andy to pay $6,000 to resolve the debt. However, since Andy enrolled, the credit card company has charged him interest and late fees totaling $2,000, so that Andy now owes $12,000. By getting a settlement for $6,000, Company H has saved Andy $4,000 ($10,000 minus $6,000) or 40% of the debt at the time of enrollment. It would be deceptive for Company H to claim to have saved Andy $6,000 ($12,000 minus $6,000) or 50% of his debt. Include the impact of your fees on the claimed savings. You may not inflate your savings claims by excluding the fees your customers paid you. Example 9: Betty owes $10,000 on her credit card, and signs up with Company J’s debt relief service. Company J gets a settlement allowing Betty to pay $5,000 to resolve the debt. However, at the time of settlement, Company J charges Betty a $1,000 fee for its work. It would be deceptive for Company J to claim to have saved Betty $5,000 – or 50% of her debt – because Betty also had to pay $1,000 in fees. Instead, Company J may truthfully state Betty’s savings as $4,000 ($5,000 minus $1,000) or 40% of Betty’s debt. In calculating the results you’ve achieved over time, you must include customers who dropped out or otherwise failed to complete the program. Don’t base your savings claims only on customers who successfully completed your program. Example 10: Company K had 10 customers signed up for its service. Each one had $10,000 in unpaid credit card debt for a total of $100,000. Five of the customers completed the program, and each saved $5,000 – for a total savings of $25,000. The remaining five customers dropped out of the program, each one still owing the $10,000 they owed when they signed up with the program. Taken together, Company K has saved its customers $25,000 – or 25% – of the total $100,000 debt they had when they signed up with the program. It would be deceptive for Company K to exclude the drop-outs and claim that it saved its customers 50% of their debt. Include all debts enrolled by your customers, not only those that have been settled successfully. In calculating your savings claim, you may not exclude accounts you failed to settle, even if the failure was due to customers dropping out of your service. Example 11: Company L has 10 customers, and each of them enrolls two $1,000 debts in the program – totaling 20 debts or $20,000. Company L is able to settle 10 of the 20 debts, each for $500. However, it was unable to settle the remaining 10 debts before those customers either completed or dropped out of the program. Thus, Company L has saved its 10 customers $5,000 or 25% of their debts in the program. It would be deceptive for Company L to exclude the 10 accounts that weren’t settled and claim a savings rate of 50%. While the FTC examples apply specifically to debt settlement companies, the examples can also be used as guidance for other debt help. For example, the success rate of a mortgage modification or credit counseling program. Nearly all credit counseling programs will not put their performance numbers or success rates in writing. That should certainly make you wonder why. Here is a good example of a credit counseling group that does put their performance measurements in writing and you can use that to evaluate what you should expect from other credit counseling groups. For example, if a company is trying to sell you mortgage modification help for thousands of dollars, certainly they should be willing to provide you with documentation to show how successful they have been. And even supply performance data with your specific large lender should be on file. If they are unwilling or unable to provide you with such data, that should make you hesitant. Remember, their data must show the performance of all clients enrolled, not just successful clients. Check With the Attorney General Office. You can find the current Attorney Generals’ listed here. The links to their websites will be there as well. You can contact the Attorney General office in your state and their state to inquire if there are any complaints on file. The Attorney General office may also be able to help you determine if the company should be licensed to provide the services they are selling you and check if the company is licensed. Check With the BBB. Don’t even get me started on the BBB. 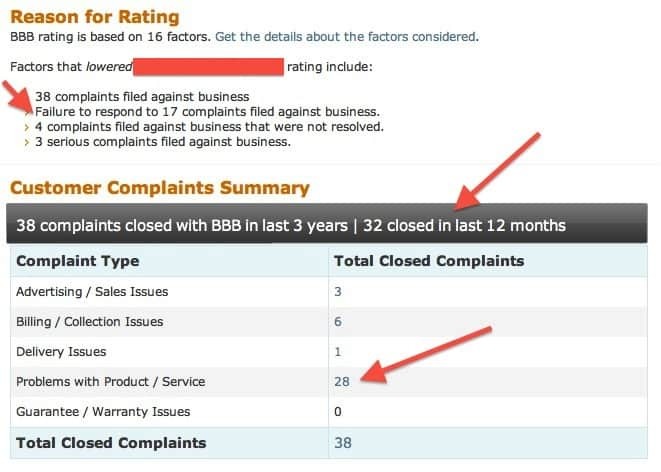 While there have been some valid criticisms of the BBB, they still remain a well recognized repository of complaints and company information. You can search a company here.A BBB rating is not in and of itself the singular clue you should check. I think the companies response to previous complaints is more important. Check to see if previous complaints resolved satisfactorily? Does the company have complaints they’ve never responded to? For me, that’s more disturbing. Also look for how many recent complaints the company may have and the type of complaints. If they are complaints about the product or service that should be a big red flag for you. Search GetOutOfDebt.org. If the company is going to sell you debt relief assistance and people have had a problem with them in the past, they may have already appeared on the GetOutOfDebt.org website in either an article, reader question or a consumer complaint. The search box for the site should be somewhere up near the top right. Is a Lawyer Selling You Financial Help Services?If you are being asked to pay a large amount of money for financial help services like mortgage modification or debt help by a lawyer, it is only prudent to find another attorney licensed in your state and pay for a second opinion, first.A second opinion will allow you to get a better idea if the claims being made to you are realistic and reasonable. There should be no problem in any attorney being comfortable with their claims when reviewed by another attorney licensed in their state. Think about it like this, do doctors complain when you as for a second opinion about a medical condition? No.You can also check to see if the attorney is licensed to provide legal service by going to the website for the Bar association in the state. You MUST Read and Understand the Contract Before You Sign It.Long legal agreements are boring to read. That’s a fact. The average person easily gets lost in all the tiny print and legalese. That’s normal. But you need to understand that the contract you are signing is what you are agreeing to, not what the representative told you on the phone.I’ve seen plenty of contracts that say No Refundeven though the representative told them there was. I’ve also seen plenty of contracts that make you agree that there are no guarantees or ask you to waive some of your rights away. And then there are the contracts that even say that everything you were told on the phone is not valid.If you are being asked to agree to pages and pages of text, you must understand the agreement is written to protect the person selling you the services, not you. You absolutely must understand what you are agreeing to before you sign the document. If you don’t understand, ask for clarification in writing or take the contract to a lawyer licensed in your state and ask for a second opinion. Consumer advocacy lawyers can be located through NACA.net. Print Out The Company Web Pages.If you feel you are going to use the services of a particular company and you have relied on statements on their website or their website as a whole, print out those pages and keep them in a safe place. They will come in handy if you have a problem with them in the future. Also, save every email the company sends you and print all documents they send you and keep all that information is a safe place you can get to it if a problem arises. Do a Web Search.Before you do anything, do a search of the web for consumer complaints. You can search by company name and also search for their phone number.Individual consumer complaints may not be real, valid or accurate but it won’t take long for you to recognize a pattern of complaints. It’s the overall pattern that creates a red flag for me.For example, not every customer is going to be happy. That’s a fact. But it’s how the company handles those customers that’s more important for me. I even wrote a guide on companies can handle upset customers and it’s a good guide on what you should look for and expect from a good company. Read How to Handle a Consumer Complaint Like a Pro And Come Out Smelling Like a Rose. What I have observed is online consumer complaints that are then followed by glowing comments. People that are unhappy, complain and shout. People that are happy may post some comments on review sites but they don’t typically run around responding to every unhappy complaint. That’s the mark of someone trying to neutralize complaints, not respond to them. In my opinion, ideally what you want is a company that will work hard to resolve any issue that might arise, not get upset over it and attack. Use the complaints you may find online and the responses as an example of the integrity and professionalism of the company. That should be an excellent start for you to check out a company or business before hiring them. If you follow my advice above you will have done more than 98% of people do before hiring a company. The information you learn will help you to make a well informed decision if the company is right for you. Author: This article was contributed by GetOutOfDebt.org, a site that provides free help for people looking for advice on how to get out of debt or getting out of debt. Wow, that is a comprehensive article. The thing that I find odd is that people get ripped off and complain about it – but when you asked if they did any research around the company the answer is “No”. Quite often when people are financially strapped and feel pressured to act, it is easy to let their guard down and believe someone who seems to be saying all the right things to them. It is unfortunate, but there are a lot of people that prey on others in vulnerable situations. It is especially difficult in the debt relief industry where a vast majority of the programs are no good for consumers. If you hear the same lies over and over by different sales people from different companies, people tend to start thinking they must be true. With the advent of the internet it is easy for many scam and shady companies to victimize the uninformed and the naive. However, I believe the internet also can come to the rescue. In addition to the important points you outlined, one of the basic things one can do to verify a company is to know more about it on the internet. For example, turn to its facebook page, its blog, and other social media handles of the company to see what the general opinion about the company is amongst its existing customers. This could be of great help, in my opinion. Thank you very much. Those tips are very helpful. We get so much of this in my office. People don’t check out debt management companies first and then want to cry the blues when they are ripped off. It’s essential to check these companies out first and even obtain personal referrals if possible. A one-stop resource for everybody who wants not to become a victim to scammers! Thanks for the great tips. I consider myself pretty seasoned in scam-avoidance but even I learned a lot from this article! Be cautious if the company is unwilling to provide contact information of satisfied sellers of similar businesses. This tips are very helpful! Let us all avoid scammers! Great tips Steve that I think will help keep a lot of people out of trouble. I think many people just get impatient. They have a problem. They want it solved. The first person that says they can solve it gets their business. Sometimes you have to take a step back and not make hasty decisions.